The Fall go deep into the shed on this one attempting to recreate and sustain the fury and confusion of "Sister Ray" by the Velvet Underground over the course of an entire album. That sound defines the album- dark, cavernous and muffled. It IS, along with Joy Division and some of PiL's finer moments, the hangover after the punk drunk. The Fall had become simultaneously more stripped (less rikky-tikky keyboards, busy drums, melodies) and more full (two guitars, chimey clangy harmonies, denser sonics). It also features one of the finest attempts at wedding musique concrete with post punk in the form of "Spectre Vs Rector," a story-song of exorcism. Recorded in an what sounds like a cave, this song features a resolute pummel riff worthy of the Swans and enough 'atmosphere' to really enhance the lyrics. In addition to recalling VU, the album also harkens back to rockabilly, Bo Diddley ("Dice Man") and a sort of C&W soul ("Flat of Angles"). Some of the older style shows up in "Choc-Stock" and "Psykick Dancehall," but on the whole this is a fine transition to the newer more mature and definitively post-punk Fall. The two finest moments on the album are "A Figure Walks" and "Before The Moon Falls." "Figure Walks" is a moody unclassifiable dirge (in the good sense), with distant tribal thumping and a nagging riff. There is a sense of unease that pervades the track. In it, Smith seems to be encapsulating his 'always forward always changing' policy, insisting the the unknown behind is far worse than the unknown that lays ahead. This theme is reiterated many times in Dragnet, particularly in "Dice Man." It would seem that Smith had wrested control of the band from those who wanted to make it more 'commercial' or to stay with the sound they had established on Live At The Witch Trials. Again, the themes of self determination crop up, both from the clutches of the music business itself "I could use some pure criminals/to get my hands on some royalties," and from other influences within the band. All over a powerful and catchy strummed guitar line. 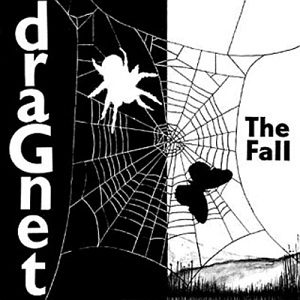 Dragnet (and its partner the live Totale's Turns) stands in stark contrast to the clean quirky punk of Live At The Witch Trials. There is no room for 'fun' on this album, (only the mocking "Choc-Stock" or the album's closer "Put Away" come close to the older singles) only the freedom of an oppressive vision unleashed. The sound and themes of this album are a pointed attempt to break the Fall free from the current musical trends and shove them off into a blasted wasteland of their own creation. A truly pivotal album in their career, as essential as it is impossible to find.